Like many people, I started drawing when I was a kid, with random scribbles and misshapen doodles. I remember thinking that I wasn't too bad - I was definitely at least a bit better than most of my peers, I was sure. My confidence was founded on the fact that, in my free time, I would draw a lot: short but humorous comics, inspired by Garfield, Calvin and Hobbes and the like; fantasy characters due to a certain popular RPG a lot of grade schoolers back then played; and whatever else in my life that compelled me to put pencil to paper. Despite my early interest in drawing, it never amounted to anything substantial. Aside from a fairly informal extracurricular art class I took as a kid, I never really developed my drawing beyond a passing hobby. Maybe it was because I wasn't enthusiastic enough in expressing my desire for a more formal education, or maybe my parents just didn't feel I was actually that interested. In any case, I ended up just drawing as a hobby for as long as I can remember. When I look at my drawings , I can't help but feel that they're pretty bad. When I do something I like or enjoy, I'd prefer to at least be on a level where, while I wouldn't be up to snuff compared to a professional, I'd still have a respectable amount of skill. With drawing, I'd at least like to have solid fundamentals and the skill to draw the things that I like. Despite these relatively straightforward goals, I think I've still got a long way to go before I'm at a level where I'm satisfied. Getting better at drawing, at least for me, is pretty different from getting better at many other things. It's straightforward in that you need to ensure you're practicing consistently; but at the same time, it's confusing because it's hard to know what you need to do in order to practice effectively. Since coming to Duke, I've been on-and-off in trying to further develop my skills, buying drawing books and watching video tutorials. And while there has certainly been a noticeable improvement from my drawings in Freshman year compared to those I can make now, I still feel like the progress I've made is small and insignificant - that simple things that I 'should' be able to do are still a challenge. This class has certainly pushed my boundaries and, perhaps more importantly, showed just how weak my fundamental skill really is. It's not a bad thing, though - I can now see more easily in which direction I need to go in order to get better. I'm definitely going to give lessons a shot. Hopefully next semester I'll feel that I've truly made progress. Art has always had a role in my life. While my drawing skills are not the sharpest, I have had much exposure to creating, enjoying and analyzing art. In elementary school, we had monthly Art Appreciation sessions where a student’s parent would facilitate a conversation with students about a famous work of art. I fondly remember having surface level discussions about da Vinci, Van Gogh and Picasso. I also enjoyed these events because my mom often led them. My mom’s house is filled with art. Paintings of ballerinas or the seaside she made from before my sister and I were born. Figurines she made of Madonna and Child before I was born to channel her emotional desire to have a second child. Ceramic mugs, plates and bowls she made and dedicated to my sister and I. The list goes on and on. And they weren’t just in the house, I helped her as she displayed her works at local exhibits. From the Festival of India to small galleries in the NoDa district of Charlotte, my mom’s works have been all over the city. Such experiences have made art in general and drawing specifically a very personal and emotionally powerful tool for me. One of the main reasons I chose to take this course was that I missed being creative on a regular basis. Last semester, I went to the Arts Annex a few times just to paint and destress. I thoroughly enjoyed it and knew that I would hate myself if I didn’t take advantage of more artistic opportunities that Duke offers. I had some exposure to art via Duke’s in my FOCUS program last year. Oriented around Medieval and Renaissance History, I analyzed Leonardo da Vinci’s notebooks. Seeing his sketches and appreciating the intersection between art and myriad other fields gave me great joy. Da Vinci treated humans as a microcosm of the Earth. This connectedness between humans and their surroundings is one of the most important values to me. This inspired me to connect my interest in environmental policy to my drawings in this course. Such deeper level analyses of art have become important to me largely thanks to my father. I remember going to museums with him and my mom for most of my life. Whether it was to the Mint Museum in Charlotte or the National Gallery of Modern Art in Delhi, I’ve always been able to have a nice conversation discussing the underlying social, political, philosophical or comical themes that a work of art may have. Putting such elements into my pieces was something important to me. Although I struggled with many technical aspects of drawing, I feel that this course allowed me to grow tremendously. Looking at the final piece I made, I know for a fact that I would never have been able to make such a work before this course. I’m thankful that Trinity requires students to have Arts, Literature and Performance classes to graduate. This course helped me gain confidence in my own work while also having built in time for creative expression. I look forward to continuing to draw–whether that be doodles in notes, weekly sketches, or creating a larger piece– for years to come. This course has taught me to be more patient. One of my least favorite aspects of drawing is that you cannot simply move your pencil as quickly as possible and expect to produce a quality piece. Taking the time to slow down, think about what I want to make, and determine the most effective way to put my thoughts onto paper was important in this course. Roy Adsak wisely asserted that: “Great art is not what it looks like, but what it does to us”. Indeed, art and its subsequent impact has the power to alter perceptions and thus can act as a vehicle for instigating change in the world via its viewers. So, how can it change the world? (and us simultaneously). Art, especially the act of drawing, prompts individuals to be more reflective and thus can act as a form of meditation. It’s no surprise that this recognition has manifested in the plethora of mindfulness colouring books (for adults!) seen today. It draws one’s focus away from the otherwise omnipresent allure and grip of social media and allows for one to connect with oneself – which is critically important in a world where we are so disconnected from ourselves. Art also promotes an open mindedness to uncertainty and helps individuals embrace their fear of failure (since you can never fully predict an outcome in art). This – just like in life – is what makes it fun – it’s unpredictable, yet incredibly rewarding. In this sense, art is an organic process that enables one to become fully present and relish the moment, rather than the outcome (that society is pre-conditioned to focus upon). It has taught me lessons translatable to life that although certainty is comforting (in art and life) it doesn’t allow for growth. Real art and real living is all about embracing risk. When we try to control one’s drawing to look at specific way or attempting to make it “perfect” looking we stagnate its impact, potential and critically its character. In many of the drawing assignments we did for this class, we focused on observational drawing which requires total focus on the object or photo of the object. It is in undertaking these drawings that we become more aware and our drawings come to life due to the subsequent authenticity and lack of pretence that ensues. The detail one is able to create from observation, creates a sense of beauty and an awareness of it. For example, following this class I found myself more detail oriented and appreciative of beauty’s intricacies. Art is a calming form of meditation and for some, self-medication that helps dissipate anxiety and grounds oneself. Furthermore, observing other’s art allows us to empathize with other’s experiences - which lends it self to innovation and creativity. People are often quick to categorize art as a solitary discipline, yet it’s impact is undoubtedly holistic infiltrating all aspects of life, especially our Psychology. The insight we can glean into other’s lives from art can have an emotive impact on us as viewers. Thus, art is a lesson in living. Art changes us, it can thus subsequently impact the world. Art connects us to ourselves, helps overcome fear of failure by helping us embracing risk. In this sense, art is a connection to our most authentic self and helps us to be sufficiently courageous to “live” and not just “exist”. I started drawing as a really young kid, probably about 5 or 6. My parents have this huge collection of stuff I used to draw when I was little. It's funny, there would be periods of time where I would just draw the exact same thing over and over again. Spiderman is a good example. I became obsessed with Spiderman after I saw the movie, and there is a huge box filled with just drawings of spiderman. I guess I just liked to express what was going on in my imagination. As I got older, my drawings started to mature as I did. Things turned from 2D to 3D. I learned to draw things as they truly were, and represent them as accurately as I could. I'm really obsessive when it comes to a drawing I'm working on. If one little detail is off it drives me crazy. As I got older and better at drawing, I started to be able to get the drawing really really close to the original from whatever I was drawing from. I did this for a while, where I would just recreate pictures with pencil and paper. And I don't know why but one day the thought popped into my head, what's the point? If you're already looking at a photograph of something, why spend so much time and effort to recreating, best case scenario, that same photograph? That was my goal in most of my drawings, and I realized it was stupid. If you look at all the great artists in the history, whether it's Vincent Van Gogh, or Frida Kahlo, or even the sketch artist M.C. Escher, they all are very unique. Every great artist brings their own unique aspect to their art, whether it is a painting style or technique, or the mind bending content like Escher puts into his drawings. That's why I really love M.C. Escher's work. He creates narratives that although are very realistic in nature, are impossible to occur in the real world. His mind is unbelievable and he's able to express that to the world through art. And that's what I think drawing, and all forms of art for that matter, is really about. It's about representing YOU in whatever you are doing. Letting YOUR imagination run wild and see what it can produce. Easier said than done, though, thats for sure. It's something that I am still struggling to find myself. But once you are comfortable and familiar enough with yourself to do that, then you've got something special. That's all I got. When I enrolled in this class, I thought that I knew the basics of drawing. I had taken art classes in high school, but most of the classes were just free draw for an hour a day. The teacher never really critiqued our work, and I didn’t feel like I improved, although my love for art grew over the years. After drawing by myself for so long in high school, I really thought that I had it down to an art (pun intended). However, I soon learned that I had become so accustomed to my abstract sketches and ink hatching that I had lost precision in drawing from observation. Specifically, my lines were not straight and a lot of objects would be out of proportion. 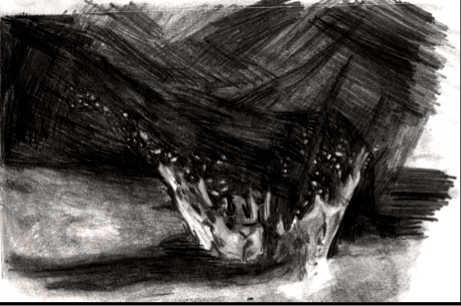 Of course, I thought that when drawing something abstract, it didn’t really matter how realistic dimensions are. However, after drawing simple objects, like objects on my desk for our first study drawings, I noticed that I had trouble drawing from observation, and the little details that I had dismissed, like contour lines, proportions, composition, and values, were actually really important in making even inanimate objects come to life. Looking back at my portfolio today, I now notice the small details that make drawings from observation realistic. For example, I never changed line weight in my first drawings. Since I was so used to hatching and letting my pencil go wild with different textures, I had so much trouble making background shading one consistent color. Sometimes a simple flat ground would look like it had indents or cracks because I didn’t know how to blend my shading. I now realize that concepts like value shading, composition, line weight, and proportions are very important to abstract art also. When you take into account all of these aspects, you make your art, abstract or realistic, more detailed and interesting for the viewer. I especially liked hearing feedback from other artists in the room. Their ideas on composition and creating narratives opened new doors for me in my drawings. I always tried to get the viewer to piece together my narrative through the title, but I discovered that simple touches, like adding a clock on a time and then changing the time from one drawing to another, can create the illusion of time passing. In the future, I hope to incorporate more drawing from observation into my ink hatchings. I think it would be really cool to ink hatch one of the buildings on campus, especially since I already drew the building near Edens for one of our assignments. 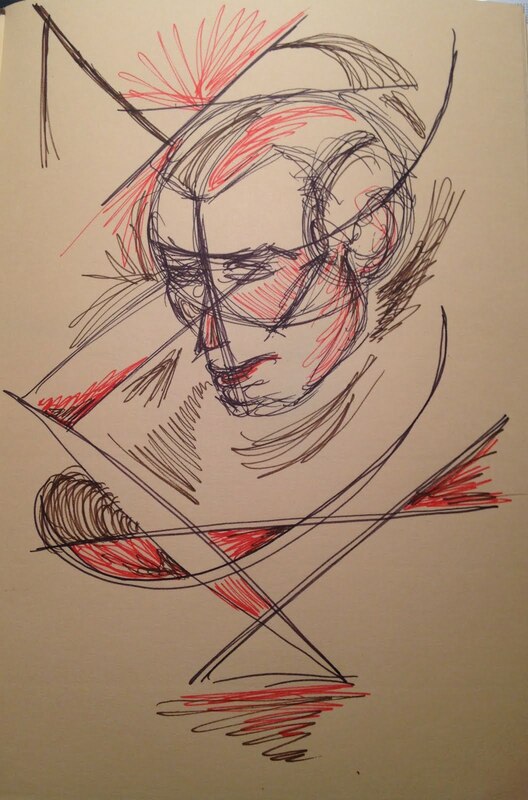 One of my drawings incorporates shading and values, line weight, and proportions in an abstract manner. I have changed the shading on this water droplet so it looks like a water droplet that has mysteriously dropped and splatted into all different directions. I especially like shadings backwards, or shading in a dark value and then erasing to create highlight areas. I hope that I can continue developing the skills that I have learned in this class to further improve my artwork. Thank you for a great semester! Draw me a picture of a dog. What do you put in the background? Do you draw a house, you realist? Do you add toys and a lake to make a canine paradise, you visionary? Do you leave it blank, focusing solely on the task presented to you? Do you plan it out first, before making the first marks on the clean white paper and risking everything with spontaneous streaks? Do you add color or see things in more than one dimension? What is your dog doing? Is he sitting, content where he is? Or is he running, heading towards something? This drawing will determine your character. A dog is something we see daily, something we all know; however, it is the difference in the way we interpret something so simple that makes us diverse. Our characters are projected through this act. With this drawing, we each reveal how we perceive reality and how our dispositions alter this image. Anybody and everybody can draw. One does not need to be taught how to create. In fact, those who are experienced in drawing often seek the freedom that comes with being untrained. Picasso himself once said “It took me four years to paint like Raphael, but a lifetime to paint like a child”. Here, he is pointing out what is most beautiful about drawing: the most important thing is imagination and risk-taking. Children rarely have any inhibitions about their thoughts. They grasp at everything and make it unique. The more experience that an artist has, the better he or she will be at depicting reality. However, the more that a person draws, the more likely he or she is to form tendencies. These behaviors that occur when someone draws can be anything from the style they use to making certain objects the same way every time. I find that at times when I draw, I am scared of making mistakes. This is what keeps my hand constrained and my lines from being fluid. When I rid myself of this intimidation and desire to draw well, I let my ideas guide my hand and things become organic. I can connect with myself. I think this is the most important part of drawing. Letting yourself be free enough in your actions to create truth. Moreover, how can one create truth when he or she is unwilling to show the bad parts of truth. In order to grow as an artist, one must let his or herself see their weaknesses and then build on them. I think that this drawing of mine represents the dynamic and experimental quality that my best sketches have. I like drawing in this imperfect style, however, I think that it is a safety blanket for myself. I think that if I want to improve as an artist, I need to focus more on depicting things in a more realistic way. Once I master those, I think I will be able to make abstract drawings that are better. This is one reason why I really enjoyed this class. I would usually not make myself draw things from still life, observation, or photographies. This class made me step outside of my comfort zone and it made me confident that my abilities could grow in that direction too.